In the hearts of the Scottish people Glamis Castle is held in special pride and affection. The centuries of its history as a Royal residence, and the romance of the long ownership by the Lyon family are fittingly expressed in the building itself. Glamis – that “magnificent pile” is the very embodiment of the castle idea. In tune with its tradition as the familiar seat of kings, it has, in our day, added to its fame by having been the childhood home of Her Majesty the Queen, whose father, the late Earl, was the 14th of the line of Strathmore and Kinghorne. Legend, as well as history, has coloured the story of Glamis. The stone chamber in the Castle known as Duncan’s Hall is the traditional scene where Macbeth, “Thane of Cawdor, Lord of Glamis, King of Scotland,” is said to have murdered Duncan, but truth has to own that the Castle, as it stands today, was built long after Duncan’s time. The place had been a favourite Royal hunting-lodge from a remote period. King Malcolm II is said to have come here in 1033 to die, after receiving a mortal wound from the arrow of an assassin on the neighbouring “Hunter’s Hill.” The Castle came into the possession of the Lyon family, who still hold it, in the 14th century, when King Robert II gave it as a dowry to his daughter on her marriage to Sir John Lyon. A grandson of this marriage became, in or about 1445, the first Lord Glamis, a title which ranks now among the oldest of Scottish baronies. Traces of the old tower that sheltered the first Lyon of Glamis and his Royal spouse remain in the crypt and dungeon of the present structure. In 1529 the widowed Lady Glamis of that day, born Janet Douglas, became a victim of James V’s unreasoning hatred and jealousy of the Douglas family. On a trumped up charge of conspiring to kill him, he had her burnt at the stake on the Castle Hill, Edinburgh. Her son, Lord Glamis, a boy of sixteen, was sentenced to death, but this sentence was not carried out, although he was held, “according to the King’s pleasure and had his estate forfeited. King James spent most of the rest of his life at Glamis and held his court here with his Queen, Mary of Guise, and their daughter Mary, later Queen of Scots. When the King died in 1542, Lord Glamis was released and the forfeiture of the estate was rescinded by Parliament. Mary Queen of Scots, with her four Maries, “rested” at Glamis on her famous progress north to quell Huntley’s rebellion in 1562. The menu of the dinner they ate is still in existence written in manuscript by the Queen’s French secretary. In 1606 Lord Glamis became first Earl of Kinghorne. The upstanding central tower of the Castle, which conforms to the usual L-shaped plan, is the oldest part of the building and is mainly of 15th-century date. It comprises the entrance in the re-entrant angle with the circular stair turret over. This turret was remodelled and refaced by the first Earl, who was in possession from 1578 until his death in 1615. An inscription over the doorway, records that it was “Built by Patrick, Lord Glamis and D. Anna Murray.” Dame Anna was the daughter of the Earl of Tullibardine and her monogram, together with that of her husband, appears on various parts together with the date 1606, the year Lord Glamis was created Earl of Kinghorne. Their cyphers, surmounted by E. and D. (Earl and Dame), are to be seen over the large window of the great hall in the view of the entrance. The tower was originally four storeys high, the three lower storeys being stone-vaulted. Round the top of the walls, which are fourteen feet thick in places, ran the usual corbelled parapet. Some of the corbels still remain on the west side, level with the corbelling of the angle turrets. They show the extent to which the tower was subsequently heightened when the tall angle turrets and roofs were added. Fig 2. The entrance, in the central tower, framed in family coats of arms. Patrick, the first Earl, commenced the low wing to the right of the entrance, at the south-west angle of the tower. This wing was completed by his son the second Earl who, in 1620, put up the plaster ceiling in the great hall. His monogram, together with that of his wife Margaret Erskine, is to be seen there over the fireplace. The elaborate plasterwork of this ceiling was carried out by the same English journeyman-plasterer who executed the similar ceilings at Muchalls and Craigievar in Aberdeenshire. It is this room that Patrick, the third Earl, refers to in the Glamis Book of Record as “my great hall which is a room I ever loved.” It is lit by three deeply embrasured windows and has at one end a small chamber in the thickness of the wall, called the well-room. This enabled water to be drawn up directly from the well below in the event of a seige. In the hall is kept the motley dress of the old family, fool or jester. This is probably the only complete dress of the kind still extant in Scotland; the family, having retained the services of their private buffoon until comparatively recent times. The famous “Lion of Glammis,” [is] one of the many treasures of the Castle. This is a 17th-century beaker in the shape of a lion. It holds a pint and tradition decrees that when handed to a visitor it must be emptied to the Earl of Strathmore’s health. In 1672, Patrick, the third Earl, was granted a new charter, becoming Earl of Strathmore and Kinghorne, Viscount Lyon and Baron Glamis, as well as of Tannadyce, Sidlaw and Strathdichtie. Since both his father and grandfather had been compelled to raise money for the Royalist cause on the security of their estates, when he returned from his studies at St. Andrews University in 1660, at the age of seventeen, he found both his places derelict and made their restoration his principal concern. 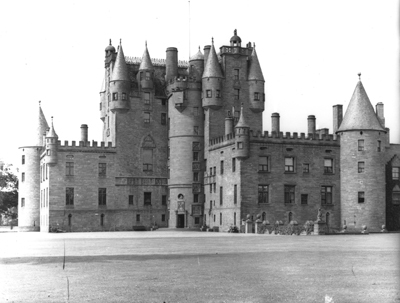 Glamis was by then practically denuded of furniture and Lyon, now known as Castle Huntley, literally uninhabitable. The Earl excuses himself for not having called in the “Public Architecteurs,” but we do not know how his grandfather, whose earlier reconstructions of the Castle were of greater importance, acted. It was the common custom at the time for noblemen to engage the same craftsmen and artists as were employed by the King on the Royal Palaces. The “Master of the King’s Works” at the time was William Schaw. 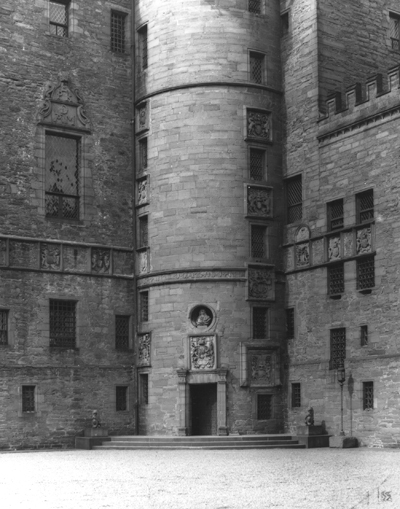 He died in 1602 and his monument records that he “was most skilful in architecture, and was early recommended to great persons.” It is conceivable, therefore, that he may have had a hand in the renovation of Glamis.